At New Wave, we are proud to bring you Unite. A premium hair care line. Unite hair care specializes in creating paraben – and sulfate-free, non animal tested and completely vegan products that will keep your hair – and the world around it – healthy and happy. Our leading team of Stylists at New Wave Hair Salon in Unionville, is a leading salon that has been uniquely selected to feature this incredible product line straight from the UK. 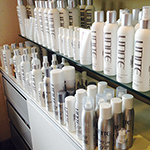 Speak with our stylists about your hair needs, be summer ready with Unite’s amazing line of beach products and let’s discuss how we can help keep your hair looking healthy, shiny and at its very best all year round.